I love fish and fishing. Whenever I am in Terai, I bend the spring of a ball-pen into a fishing hook, tie it to a strong string, add a pulli (float made out of santhi, the jute stem), tie a yard long string to a bamboo stick – and my fishing rod is ready. I knead a handful of wheat flour for the bait. It looks clean and I can catch small pothi fish (Puntius sophore). Earlier, my granny used to buy fishing hooks for me from the weekly haat (local market) before I was there for my winter vacation. Earthworms used to be the regular bait as they easily attract fishes like garai and chenga (Chana gachua). I used to catch a handful of fish within hours. However, now I hate piercing the slimy earthworms into the hook, and instead put lumps of wheat flour which is much cleaner. Though the catch is small, the experience is much pleasurable. You can imagine the fascination for fishing. It has always been a favourite pastime for Tharus. Apart from cultivating rice, wheat, and cereals, they have been fishing using different equipment and methods. The most common and easiest method is fishing by hand in muddy water. Children and women search for fish in paddy fields and ditches as the water level lowers. During the rainy season, when the fields are full with water, dhasha, chachh, and koniya are fixed between two adjacent fields. The traps are woven out of bamboo culms or sunn stalks (Crotolaria juncea). The fishes get trapped in them while swimming along the current of water. Dhasha and chachh are rectangular, envelope-like in shape and can be folded when not in use, while koniya is a conical trap. A rectangular basket like trap called dharya with several openings is still used by Tharus, but it is a rare sight these days. From east to west, the Tharus have been using different types of net traps like the hoop net (helka), small square net with handle (tapi), casting net (jal) for fishing. The casting nets depending upon thier sizes are called khauki jal, feki jal, and mahjal. Khauki jal is a small square shaped net tied to two bamboo straps and it is easy to handle in ponds, ditches, and rivers with low water level. I have seen this trap in many parts of Nepal and India, but it was surprising to see the same being used by indigenous people in the Three Gorges of Hubei Province in China. The Rana Tharus use thathi which is similar to a khauki jal. Small fishes like pothi and dedhwa (Esomus danricus) can easily be caught with this net. Feki jal is the most common net, used by all fishing communities. Mahjal is the largest one, used to fish in ponds and lakes. They are huge enough to cover the whole pond. While fishing, small fish holder called deli (called kanjalo by Rana Tharus) is tied around the waist. It is usually made of bamboo culms or sunn stalks. While Tharus enjoy fishing, the old ones still remember the stories about fish and their ancestors, told by their fathers and grandfathers. Among many interesting stories, the one narrated by Somla Mahato of Chitwan tells how gullible the Tharus are and how the Almighty helps the honest. A long time ago a barber (hajam) was going about his work during jitiya parab (women's festival). As he was going from house to house to cut the nails of women, he suddenly saw a strikingly beautiful woman named Chanawa. She and her husband Lori Amir were new to the village. When the hajam caught sight of Chanawa, he lost consciousness. Then he ate soil seven times, pissed seven times and shat seven times. When he came to, he got the idea to go to the king of the village, Raja Mahore, in order to tell him of Chanawa's beauty, and to suggest that he might kill the woman's husband and then take Chanawa as a wife. When the king heard the plan he said that the woman's husband was very strong. The hajam proposed to the king that he should write a letter to the king of Maranpur (Murder City) for Lori to deliver. In this letter the king would write that Lori was to be killed in Maranpur. The king was pleased with this proposal, and he wrote the letter: 'Head of Lori, sword of Maranpur'. Lori was summoned, and the letter handed to him with the instruction to take it to the king of Maranpur. Lori did not see through the king's plan: he thought that he simply had to deliver an important letter. Lori was unable to read and write, but his wife Chanawa could. The woman asked permission from her husband to read the letter. When she had read the words, she understood that her husband was to be killed in Maranpur. She proceeded to alter the letter by switching the words head and sword: 'Head of Maranpur, sword of Lori'. She advised her husband to return to the village of King Mahore and ask him for a horse to convey him more quickly to Maranpur, the way being long. Lori went to the king and asked for a horse. When the hajam heard this, he got a new idea of how Lori could be killed without being sent to Maranpur. A horse named Mangal had been stuck for 12 years in the swamp of Pokhara Sagar (ocean). It was a very wild horse, one that only let its master ride it. The horse had belonged to Lori's grandfather, which Lori, however, did not know. The hajam now suggested that the king charge Lori with retrieving this horse from the ocean. The horse would kill Lori as soon as he approached it. The king, therefore, directed Lori to fetch the horse Mangal. When Lori approached the horse, it became very happy, for it smelled that the grandson of his own master had come. The horse neighed with delight! The hajam heard the neighing and thought that now Lori would be killed. But Lori freed the horse from the sagar and took it first to Pokhari Tal (lake), the horse being very dirty. In the feet of the horse were living many worms and maggots which caused the horse much pain. Lori began to remove the worms. The worms swam about in the water, not knowing what was happening to them. Then they went up to God and complained of their fate. God decided: You will become fish of various types and sizes, according to your present size. Humans will eat you during Kalijug (the current age). There have been fish since that time! Taken from “The History of Fish (and Women) (narrated by Somla Mahato)”: an excerpt from “The Voices from Chitwan: Some Examples of the Tharus’ Oral Tradition” by Ulrike Muller-Boker, University of Zurich. 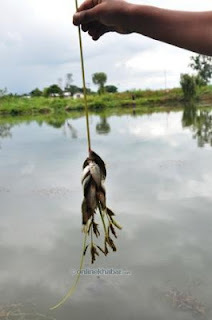 If you want to know more about the Tharus’ way of fishing, read “A Marshland Culture: Fishing and Trapping among a Farming People of the Terai” by Gisele Krauskopff of CNRS-Universite de Paris X, Paris. Do you have an interesting story to share? Join the list of contributors writing on Tharu culture and issues. Drop your request at sankuchy@gmail.com.